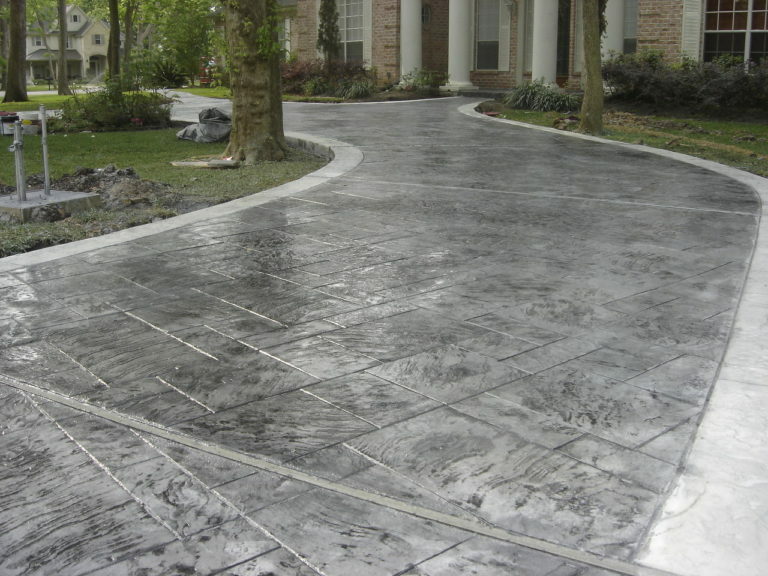 One of our most popular choices for hardscape installs is stamped concrete! Stamped concrete is regular concrete that has been impressed with a patterned stamp, leaving it with a fancier look such as slate,flagstone, brick, and many other options! Most stamped concrete projects that we have build recently include a color admixture that comes mixed in the concrete. In order to make sure the stamp pattern does not stick to the concrete, a “release” is used. This chemical allows for the clean removal of the stamp pattern leaving a crisp imprint. One type of release is a “liquid” release, which is often sprayed onto the concrete immediately before applying the patterned stamp. Another option is to use a “powder”release, which often contains a second color—this leaves a deeper color effect,and can achieve a visual similarity to weathered stone or brick. Some clients enjoy the “wet look” on their stamped concrete—this can be achieved by applying a few coats of concrete sealer initially and again annually to achieve this look. Different concrete sealers are available with more or less gloss. So whether you are looking to add a sitting area, a stamped concrete patio with a fire pit built in, or whatever your stamped concrete project may be—we are ready to help discuss the options and build something beautiful and functional for you!